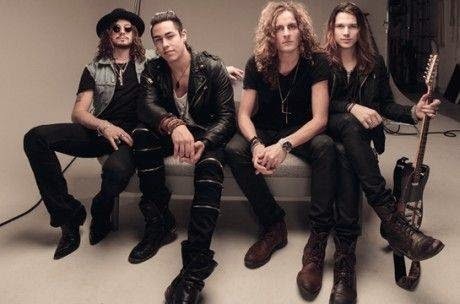 It’s mightily impressive that Reach (who consist of 3 very young lads and 1 x young lad) take their influences and references for some of the melodic rock greats of the 80s - Whitesnake, Journey, HEAT, Giant etc., etc. They've been together since 2012 and their first release was a cover video of Avicii's "Wake Me Up". The video has of today been seen by an amazing amount of people - almost 1.3million (1,269,830). Yes, 1.3 MILLION !!! Which is bloody fantastic and amazing in equal measure in this day and age. Either that, or the lads mum's have watched it 317,457.5 times each! Reach are Alex Waghorn (vocals), Ludvig Turner (Guitar), David Jones (Bass) and Marcus Johansson (Drums). Marcus and Ludvig may have appeared on your radar last year with Adrenaline Rush. Reach is the band that is likely to pay the bills. Rock bands in Sweden are ten a penny. In fact, I think its a government ruling, that when you finish college, you have to either start or join a band. The very recent HRH AOR was almost a mini Sweden Rock, with a third of the bands on display over the main stage over the two days coming from the land of the moose, semlas and meatballs! On first inspection Reach look the part, young, good looking and have great hair (well 3 of them have great hair! ), and most of all they SOUND the part. There’s a really excellent 5 or 6 songs here that belies the lads young years. ‘You Called My Name’ comes out of the blocks like Usain Bolt after a dodgy curry. Turners guitar playing is Lynch-like, and ‘…Name’ has a big, big chorus. Similar can be said of ‘Fortune And fame’, only this ones a slow burner and grows with every passing listen. After ‘Tell Me’ the high octane tempo from the first three song lags a little, then explodes back to life with the contagious ‘Make Me Believe’ and is a cut above due to the 4 part harmonies. I had my reservations initially about the quality of Waghorn’s vocals on the very first listen, I’ve only had this CD for 4 days and after repeated listens (and seeing them twice live in a week) the lad as great potential. ‘Reach Out’ I guess is the bands anthem and springs to life and catches Reach at their best, and the guitar solo is superb. I think Reach have unearthed a future guitar god in Ludwig Turner, as his playing hand confidence has come a long way since last years appearance with Adrenaline Rush. ‘Looking For Love’ not only is an 80s sounding title from the Coverdale song title handbook, it has 80s running through it like a stick of rock. ‘Coming Home’ finishes 'ROTR' with a bang, the riff reminds me a bit of The Cult in their heyday, and is one of the best songs on the album, and is a huge live song. It is truly a great way to finish off the album. I only have one question fellas….what’s with the album cover and logo? It’s supposed to be a fighter jet, but it looks like a big bell. Get it changed. Make it more plane-y. 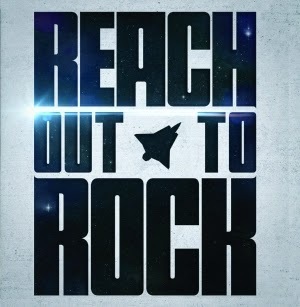 That said, ‘Reach Out To Rock’ is a massive slice of 80s influenced Hair Metal / Melodic Rock or whatever you want to call it. All I know is that it’s a bloody good debut, and I cant wait to see what’s to come over the next 3-5 years. Poodles, Eclipse, Heat etc, there some new kids in town, and they are reaching out to take the crown.